It is finally the time to continue the Superstar Project. I finished watching P. Vasu’s Kathanayakudu (2008) already a couple of months ago but didn’t write anything about it until now. I hope I haven’t forgotten too many details. Kathanayakudu is the simultaneously shot Telugu version of the Tamil movie Kuselan that I had watched a couple of years ago. The movie is a remake of a 2007 Malayalam Mammootty film Katha Parayumpol. I haven’t seen the original version so I cannot do a remake comparison. Bollywood fans might know the story also from Shahrukh Khan’s 2009 remake Billu (which I haven’t seen either). Balakrishna (played by Pasupathy in Kuselan and Jagapati Babu in Kathanayakudu) is a poor barber who lives in a small village. One day his childhood friend Superstar Ashok Kumar (Superstar Rajinikanth) visits the village for the shooting of his new movies Chandramukhi 2 and Annamalai 2 (with Nayantara who is playing herself!). Surprisingly, Balakrishna is afraid to meet Ashok again. Does the superstar care about him anymore now that he is significantly richer than his old friend? 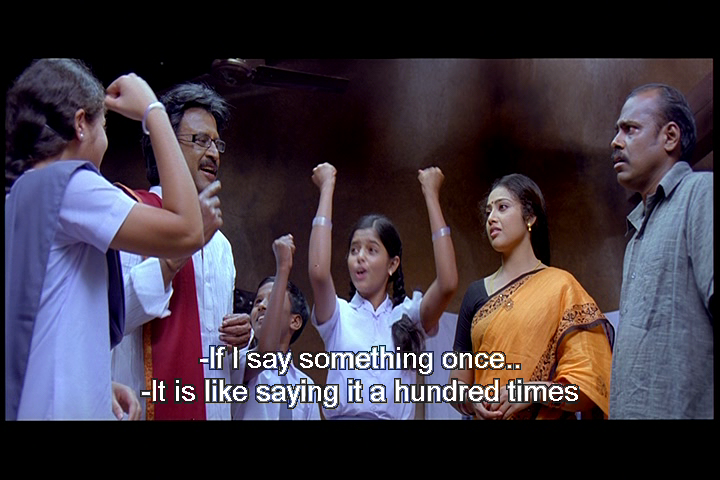 Looks like the children have seen Rajinikanth’s Baasha. I’m not sure why they named Rajinikanth’s character Ashok Kumar as it’s very clear that Rajinikanth is playing none other than himself. The film is full of references to his earlier work. It’s strange especially because Nayantara is playing herself without an imaginary character name. 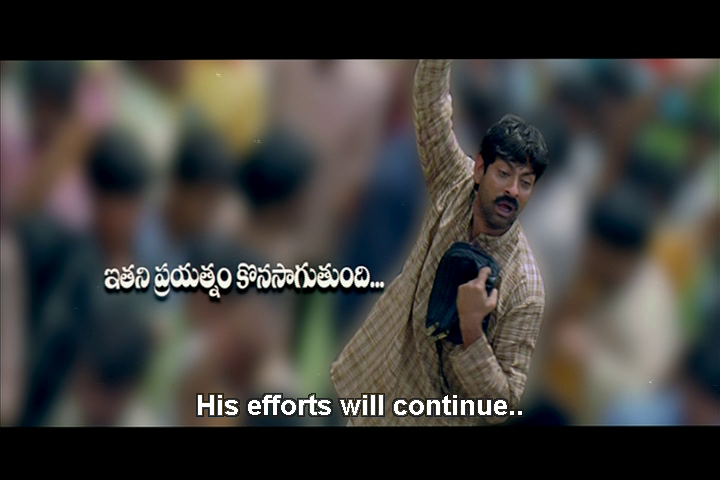 Jagapati Babu came up with one of the finest performances of his career. This role demands a tremendous histrionics from the actor in Jagapati Babu and he does a wonderful job. His get-up is also good. But one wonders why he has light beard though he is doing the role of barber. Meena plays Balakrishna’s wife in both versions (as well as in the original Malayalam version). Her role isn’t very large but she does a good performance. I haven’t yet seen many of her other films but I can’t wait to see some of them later during the Superstar Project! 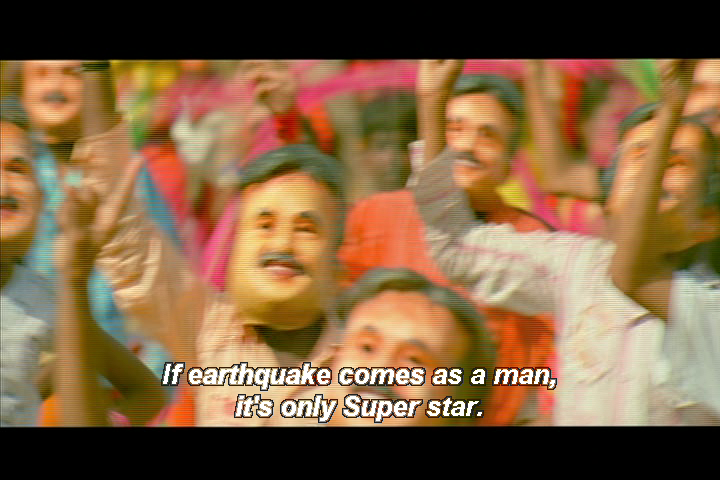 It’s also always nice to see Prabhu who has a small role in the film. Comedy could have been slightly trimmed. 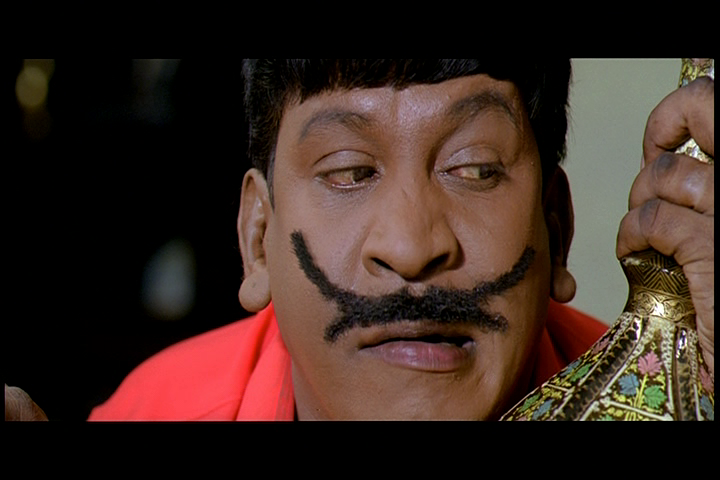 I liked Telugu version’s Sunil a little more than Tamil version’s Vadivelu. There are also other usual Telugu and Tamil comedians in minor roles, like M. S. Narayana, Ali, and Santhanam, but their jokes aren’t very memorable. I didn’t even recognize Brahmanandam from Kuselan but he was easier to locate after seeing the Telugu version where he does the talking instead of his Tamil friend. The songs are awesome in this movie! My favourite one is Rajinikanth’s introduction song “Cinema cinema” which commemorates the 75th anniversary of Tamil cinema and has several cameo appearances by celebrities of the industry. “Om Zaarare” is also very catchy. The picturizations of these two also have very epic costumes! I like the other songs too.